As the polls continue to indicate a thumping victory for the PP in November’s general election, the speculation over who will form Mariano Rajoy’s Government has already begun. However one party heavy-weight has today claimed that she is not expecting a phone call from her leader should the conservatives take power in ten weeks’ time. 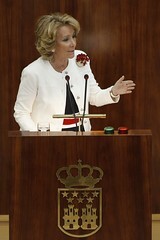 Esperanza Aguirre (pictured), who was re-elected President of the Madrid region in May, is often portrayed in the press as the closest thing Rajoy has to a rival within the PP. This morning she told reporters that she is not expecting an invitation to join the Government because “Rajoy wants me in Madrid”. When asked whether she would support a possible ministerial appointment for current Mayor of Madrid, Alberto Ruiz-Gallardón, a smiling Aguirre replied that “everything” her party leader does seems to her to be “absolutely wonderful”. It would be safe to interpret these comments as a light-hearted dig at all stories of rivalry between the two big beasts of the PP.